I love Marmite, I love mushrooms.. But it’s been well over a year since I’ve bought myself mushrooms. They are about $3 for a small container and nobody else likes mushrooms in the Hobbit house so I’ve drooled over them and walked away, knowing that my $3 needs to be spent on something for everyone. That’s the reality of living on one income..
Today I thought SOD IT! The mushrooms in my local store beckoned me and I grasped them before I could change my mind.. Here is the recipe (inspired by a recent recipe on Marmite’s Facebook Page) that is guaranteed to make you emit sounds several times like…mmmmmm and ahhhhh and ohhhhh 😦 (when it’s all gone). Top with a little grated cheddar cheese and pepper for extra taste! This entry was posted in Uncategorized and tagged 1940sexperiment.com, carolyn ekins, marmite mushrooms. Bookmark the permalink. I love mushrooms too. However as I am cutting down on fat I make mine the following way, and I find them delicious. I wash half a punnet of mushrooms so that some water is clinging to them. I crumble one oxo cube in a tablespoonful of water. Bring to the boil and add the mushrooms (quarted). Give them a good stir, place the lid on the pan and place on a low heat. The mushrooms will release their own juices. When this has happened, take off the pan lid and turn the heat up to high. Gently stir the mushrooms until the liquid is reduced to a very thick residue. Add lots of black pepper. Seve on toast . I love your website. You can always put a smile on my face. This sounds lovely. I’m going to try it. Sauteed mushrooms with cheddar cheese on a ritz cracker is divine….. 🙂 Being vegan have you found a substitute for cheese?? this is rubbish please don’t try it. I don’t know how Harry prepared his mushrooms but we’ve just tried it and it was delicious and will go onto our regular recipe list. During WW2 there was a forerunner to Marmite called Yeastrel (it was made in my neck of the woods – Edinburgh) so it may not be a modern recipe after all. 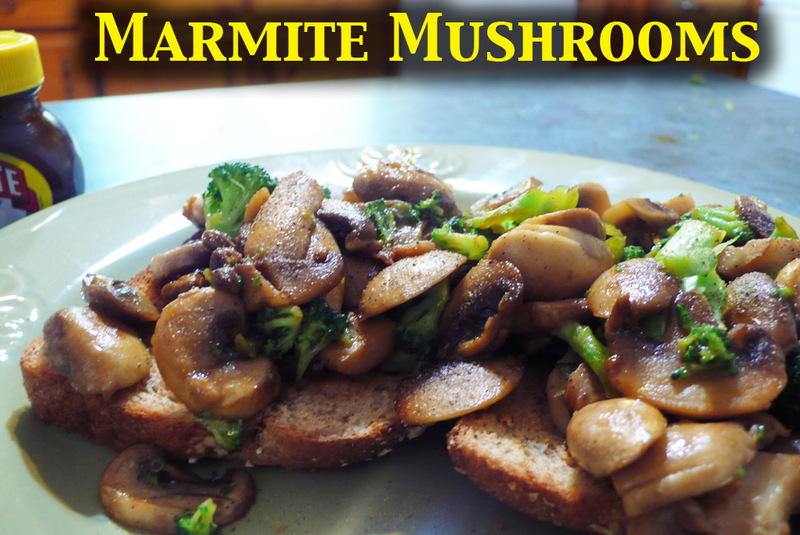 I like my mushrooms cooked with soy sauce or tamari, but I can see the similarities – Vegemite should work too. I also find that they taste even better when reheated, it must “mature” the flavour if it is allowed to “rest” after the initial cook. Try adding fried onions & something green such as pea tops, broad beans, courgettes, leaf beet, spinach or what green thing you like – all served in a flatbread or on whole grain toast – double yummo !